Congrats on wrapping up the show. How does that all feel now? It feels good. You know, people seem to like it and I certainly couldn’t be prouder of all 10 episodes. I was very, very nervous before we premiered, nervous about being in the shadow of “Breaking Bad,” because we were so proud of that. But so far it seems like people understand it’s a different show and are liking it on its own terms. That makes me very, very happy. That was such an interesting thing, for me watching it. As an audience member, every week it felt like we were figuring out what the show was, because it didn’t feel like anything else we had seen before. I’m glad to hear you say that. As we worked on it, that’s what I felt. I can’t remember ever seeing this combination of tones. It’s all based on who Jimmy McGill is and the tremendous performance that Bob gives as Jimmy McGill. I’ve got to ask: Did you know that he had that in him when you started? Well we knew — this is tricky, because I want to make sure it’s clear — we always loved working with Bob and we knew he was terrific, but we didn’t know how terrific he was going to be. He surprised us. There were many times in the editing room where we would watch the subtleties of his performance and we’d say “hey, let’s watch that again.” Just because he added so much depth and humanity to this guy. Frankly I would say he surprised us over and over again, but our expectations were already really high. If someone else had played Saul Goodman — and I can’t picture anybody else doing it — I don’t think we’d be here now. I think that Bob on “Breaking Bad,” he took a character who was really kind of cynical in his own way, and he gave him an oddly earnest quality. Saul Goodman, as Bob plays him, as amoral as he is, he has this paradoxical earnest bounciness that is not like any character I’ve seen before. Thinking back on “Breaking Bad,” is there a specific scene which was the defining “Oh, this guy could be his entire own show” moment? Sometimes we would have an idea that felt too silly, or out of left field, to fit in “Breaking Bad,” or didn’t fit with the darkness that was Walter White. And we would say “Oh, that’s for the Saul Goodman show.” That started happening almost immediately in Season 2 and 3, so it’s very hard to point to a specific moment. I would say for me, the moment when I knew we were onto something was the first big scene we had with Bob, which was in episode 208. 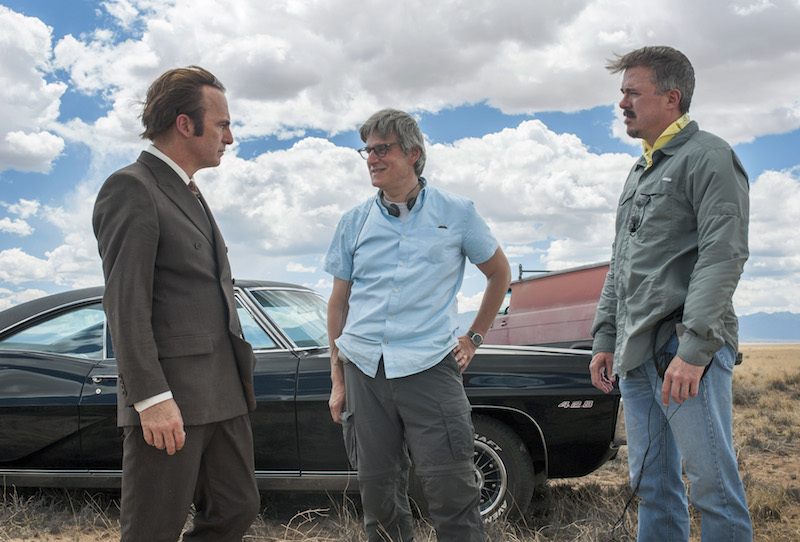 [Also entitled “Better Call Saul.”] I was lucky enough to write that one and I was on set. Terry McDonough was the director, and Bob had a scene with Matt Jones who played Badger, and he just came in and he owned the room. But there was a moment that told me that there was more to Saul, and basically what happens in the scene is he walks in and there’s a cop interviewing his client. And he more or less chases the cop out, “You can’t talk to my client without me! Go get a juicebox, baby face!” And then the cop leaves, and Bob added this little moment where he takes this little breath like “Whew, I’m glad I got away with that,” and then he gets down to business with Badger. At that moment I knew, well, there’s more to this guy than I thought. He is not just a slickster, there is an inner life to him. As we went on in “Breaking Bad” we saw more and more of that inner life, and we saw more and more that even though he will advocate being like a murderer as a business strategy, he does have a kind of morality. And Walt goes too far even for him. You asked for one moment, and I guess that’s the one moment — but that’s the big picture, too. What really stuck out for me was the fact that the first season so unique is so driven not by plot, but by character. Was that always a part of your mandate going in — that we want this to be not a show driven by twists and turns, but by people? Strangely enough, that’s always been our approach. I’ll speak for myself — it’s easy for me to come up with lots of twists and turns and showcase the scenes that are exciting, at least on paper. But if those things aren’t held together by a character I lose interest. So the challenge for us is always “Where is this character’s head at? What’s really going on with him?” That sounds easy, but that’s the thing that holds us up and stops us from forward progress in the writers room with some frequency — where we will think we understand what this character’s thinking and what he’s doing and what his strategy is –or her strategy. And we’ll find out no, that doesn’t really make sense to us now that we’ve talked about it some more. I went in expecting this to be a little more plot-driven, maybe, but that’s not the way we operate in the writers’ room, so I don’t know why I would have expected anything different. 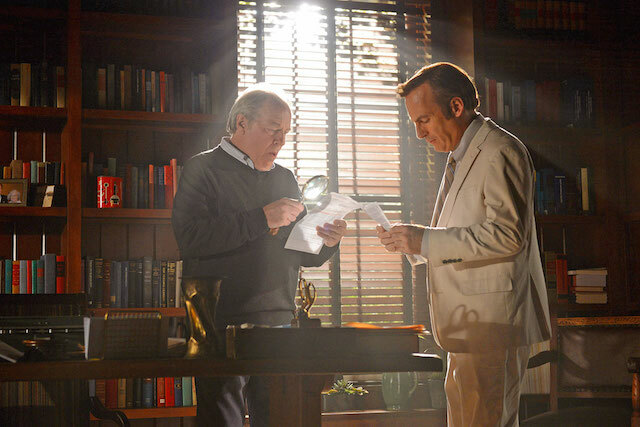 I would say that Vince and I both probably thought this was going to be much easier than “Breaking Bad,” and I think the reason for that is we thought we knew who Saul Goodman was, we thought it would be good that there wasn’t as much character to explore. So out of necessity, I guess, there would be more plot action — more strictly plot. Although I have to say to me they’re more or less the same thing, plot and character, because plot’s nothing but the actions the character takes. But when we got into Jimmy, we found that it was a lot more complicated. There was a lot more to him than we expected. I think that’s really the evolution of our thinking. And hopefully the audience sticks with us, because there are some episodes that have very obvious showcase scenes, and there are some which are quieter and more intimate and take the characters on a different kind of journey. Speaking of the plotting, you had a two-season pickup at a very early point in the whole process. Would you have plotted Season 1 the way you did if you didn’t know you had a Season 2? One of the things that having the second season pickup gave us was the freedom not to push Jimmy really fast to become Saul Goodman. There’s a version of this show where we would have lit a fire under ourselves and said “Well how quickly can he be Saul Goodman?” Once he got the idea for the name, why does he not have an office yet? And every episode he could have added one more element. That could certainly work as a show, but I think we were more satisfied with learning about this character and finding out that becoming Saul Goodman is going to be a more epic, complicated journey than we expected to begin with. Is there one specific moment from the season that you think you would have lost, had you been pushing forward harder? It would have been such a different season, it would be hard for me to pick out one particular thing. If we had been pushing harder I don’t know whether we would have understood Chuck well enough. It just would have been a completely different show. Was there a sense that you really wanted the show to be driven by Jimmy’s relationship with Chuck? Well, we learned as we started the first few episodes, there are really two people in the world who are at the center of Jimmy’s universe: Chuck and Kim. Both of them are associated with this Hamlin, Hamlin & McGill, and in some ways it’s a love triangle, with Hamlin on the other side with both of the people who are important to Jimmy. So that really was inherent in how we started. So in terms of looking forward, what do you feel like we can expect from Season 2? [Spoilers for Episode 10, “Marco,” follow.] I can already tell you that the things that I expected to happen in Season 2 have not happened in the same way. But we can definitely expect to find out what Jimmy is about if he’s not trying to please Chuck. How much was Jimmy’s desire to make it as a lawyer about trying to please Chuck? Jimmy is obviously not going to be as ethical, but how far is he going to go and what does he want? What is his ultimate goal? Does he have a plan? As he drives off at the end of Episode 10, how much of a plan does he have? I think the answers to these questions will surprise me. I think you can expect to see some characters who you’ve already met and who you may have very fixed ideas about. You may find out there are sides to some of these people that that you were not expecting.